Scientists with NASA’s New Horizons mission have assembled the highest-resolution color view of one of two potential cryovolcanoes spotted on the surface of the distant planet by the passing New Horizons spacecraft in July 2015. At about 90 miles (150 kilometers) across and 2.5 miles (4 kilometers) high, the feature – informally named Wright Mons – is enormous. If it is in fact a volcano, as suspected, it would be the largest such feature discovered in the outer solar system. 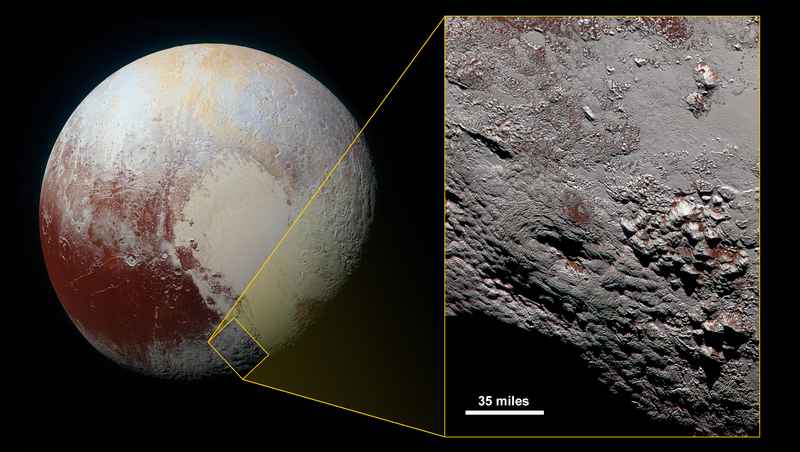 This composite image includes pictures taken by the New Horizons spacecraft’s Long Range Reconnaissance Imager (LORRI) on July 14, 2015, from a range of about 30,000 miles (48,000 kilometers), showing features as small as 1,500 feet (450 meters) across. Sprinkled across the LORRI mosaic is enhanced color data from the Ralph/Multispectral Visible Imaging Camera (MVIC) gathered about 20 minutes after the LORRI snapshots were taken, from a range of 21,000 miles (34,000 kilometers) and at a resolution of about 2,100 feet (650 meters) per pixel. The entire scene is 140 miles (230 kilometers) across.